WordPress is one of the most popular and widely-used CMS that allows creating quality, professional and functional websites. However, the system is not as easy to use as it may seem at first glance. If you have ever tried to launch a website with this platform, then you have the firsthand knowledge of how challenging and time-taking the process is. While experienced web developers have already learnt to cope with WordPress challenges pretty well, newbies face lots of unexpected problems. As a result, this affects the quality and performance of their websites. This is not to mention the waste of time and effort that may be spent on website development and promotion. To avoid these difficulties, it makes sense to use simple platforms, which are easier to master and ensure decent result. While WordPress is initially a blogging Content Management System, inexperienced users often face the need to look for simpler web building alternatives. In this respect, website builders are the best choice. These systems are intentionally geared towards the requirements, skills and budgets of newcomers in mind. They do not require coding knowledge, complex programming nuances of previous web design experience to be used to the advantage. By using a quality multifaceted website builder, launching a portfolio, a business website, a landing page and even a web store won’t be a problem at all. What you are expected to do is to sign up for the service of your choice, select a template and reach the dashboard to choose the required design customization tools to get the website ready for publication. It’s high time to review the best niche representatives now to select the platforms you’ll be able to use instead of WordPress. Blogging Platform. While WordPress was initially designed as a blogging platform, Wix now offers its own integrated blogging engine. It allows adding a multifunctional blog to your website to add and schedule the posts, adjust and modify blog settings, add a Featured Posts Section and a tag cloud, select blog templates, toggle Facebook comments, create custom feeds and more. Template Collection. Wix template collection currently exceeds 550 high quality and mobile-ready themes. They are 100% customizable, subdivided into thematic topics and available both for free and extra cost. Advanced Design Customization Options. The website builder has unique features that can notably contribute to the web page visual appeal. The tools and options available in the dashboard include slideshow integration, cinemagraphs, graphic elements, design settings, social network buttons integration, media files insertion etc. Wix ADI. The website builder offers an advanced Wix ADI tool that automatically creates any website type by using the provided content. This eliminates the need to improve your coding skills (even if you have any) getting the result you hoped to avail. Standard and Mobile Editors. If you don’t plan to use Wix ADI for some reason, the website builder grants an opportunity to manually design the selected website template as well as its mobile version. The edits made in the mobile mode are not displayed in the desktop version, while those you make in the standard editor are immediately presented in the standard website mode. App Store. While WordPress is known for its plugin integration options, Wix allows selecting and integrating hundreds of free and paid widgets, extensions and add-ons. Their selection is quite extensive and there is the search filter option to help your find the widgets that perfectly match your website specialization. All-in-One Package. Whatever paid subscription you decide to choose, you get hosting, domain, templates and other features (many of them are free) in addition to SSL security, unlimited bandwidth and storage depending on the plan. Cost: Wix has a beneficial unlimited free plan for first-time system users, who wish to test its features and practice their skills. The website builder additionally offers paid plans for those users, who plan to work with it in future. All in all, there are five paid subscriptions here, the cost of which ranges between $4.50 and $24.50 per month based on the terms included and the intentions users have. How to switch from WordPress to Wix – a detailed guide. Point-of-Sale Software. The POS software is one of the system highlights, which allows the entrepreneurs selling their products both in online and offline modes, managing several staff member accounts and synchronizing with the available accounting software. Integration and Synchronization Options. Shopify is proud of its advanced integration and synchronization options. They let you get the most out of integrating your Shopify account with those of important external systems and popular marketplaces like Amazon, Xero, Quickbooks and what not. Extensive Marketing Features. With Shopify, you can effectively boost your website statistics. The system uses a set of marketing tools, which make it possible to track, control, analyze and change marketing approach to the entire website performance process to boost its statistics, customer engagement rate and profitability (Live View Mode, access to customer profiles, abandoned checkout recovery, conversion rates and factors that affects them, multiple payment options, shopping and order parameters, location statistics, shopping activity of users etc.). Safety Measures. The system pays special attention to the safety aspect as it’s responsible for keeping the eCommerce websites created with it secure and protected from prohibited website access of third-party users. For this reason, the software has recently introduced the Fraud Protection Feature, SSL Certification, Tag and Chip Reader option, Shopcodes etc. Product Presentation. Being initially oriented on boosting user engagement and satisfaction, Shopify implements special measures to present the products offered for sale in the most favorable light. Users can create and manage appealing show windows, make use of the Augmented Reality Feature, read detailed product reviews, browse image collections and galleries etc. Cost: Shopify is not a cheap eCommerce software, but its cost is definitely worth the investment. The system has a free 14-day trial and it offers four paid subscriptions. The cost of the cheapest option constitutes $9/mo, while that of the most expensive option reaches $299/mo. The system doesn’t charge additional fees for the transactions made in it, yet it implies credit card transaction charges. The software frequently offers discounts that make it possible to save up to 8-10% of the initial cost of the plan. Exceptional Ease of Use. uKit is not just simple for everyone – its is exceptionally easy-to-use, especially for those people who don’t have a single notion of what website development actually is. This is partially due to the WYSIWYG website editor and drag-and-drop feature that allow controlling all the stages of the web design process with ease. Template Collection. uKit has a rich collection of responsive templates, which fall into niche categories and are 100% customizable to fit any niche. Enhanced System Integration. You are welcome to integrate your uKit account with that of other external services or CRM to boost the sales amount, track leads, website statistics, conversion rates and factors that affect them. This is a nice way to get extra profit and advantages from the options granted by third-party extensions you deal with, like Video and Audio Players, Analytics, streaming apps and what not. Outsourcing Capabilities. uKit Developer Access makes it possible for business owners to establish partnership relations with developers, marketers, content managers and other members, who can work for the benefit of the company. Integrated Business Widgets. The website builder has a set of business-specific widgets and add-ons, integration of which will boost your business website specialization. These include Online Calculator (the well-known uCalc), Timeline, Steps and more. Temporary Website Management Access Rights. If you intend to work on your website development with co-partners, you can assign shared access rights to them. These people will be able to make the major website changes like editing/updating the content, adding/removing the widgets and pages, accessing Google Analytics forms, configuring SEO parameters etc., but they won’t have access to the payment and billing information (it’s only the account owner, who has access to this data). What’s more, the system will automatically create the backup version of the website as soon as you enable the feature. eCommerce Options. With uKit, you can launch a web store in one of two ways – either by integrating a special eCommerce widget into the website or by synchronizing your uKit account with that on Ecwid. Cost: uKit is one of the most affordable small business website builders available out there. It has a free trial that extends for 14 days and four paid subscriptions. The cost of the paid plans extends from $4/mo for the most affordable Premium Plan and grows up to $12/mo for the most costly Pro Plan. Thus, the prices are more than reasonable, taking into consideration the business focus of the platform. Additionally, the website builder regularly offers discounts and special offers to cut down the cost of website development for regular users and newbies. Easy and Quick Installation. It does not take much effort and time to install the software. No coding skills are required as well. Everything is simple and intuitive – just follow the tips and prompts the system generates to effectively guide you through all the stages of the web design process. Enhanced Functionality. While WordPress requires plugins for each website function, Joomla has a set of integrated widgets, extensions, add-ons and features provided out of the box. This doesn’t mean, however, that you don’t have an opportunity to integrate third-party plugins or widgets from the web – there are many of them out there and it’s only up to you to decide whether you need them or not. Intuitive Dashboard. The CMS has a user-friendly and intuitive dashboard, which comes with a set of integrated tools needed to simplify the web design process for all user categories. It takes more time to master the dashboard as compared to WordPress, but as soon as you manage to do that, you’ll realize how convenient and easy it is to add and update new modules, sections, categories and other content types. The Need for PHP and SQL Database Skills. To get the most out of working with the system, Joomla implies the knowledge of PHP and SQL basics. Cost: Joomla is a free content management system. It doesn’t require any sign up or usage fees. In this respect, it is somewhat similar to WordPress. Likewise, you can come across paid templates and plugins available on the web. Much attention should be given to hosting selection. The most preferable solution when using Joomla is Bluehost. This hosting provider is currently on the top of the list in its niche. This is because the service is the official WordPress hosting provider known for its strong uptime rates, fast page load speed, advanced customer support options, flexibility, security and affordable plans. The cost of using Bluehost starts with $2.95/mo and reaches $5.45/mo based on the services and terms included into each package. See also: CMS vs website builders. Advanced Menu and User Management. The software comes with a set of features, which make it easier for users to create simple yet full-featured websites, portfolios, blogs, social networking options etc. Content Management. With Drupal, users can create and manage multiple content types, including polls, texts, videos and images, blogs etc. Customizability. The CMS is highly-customizable, which means that it’s possible to edit websites created with it, integrating and deploying new features and options. Drupal is one of the niche leaders, when it comes to reliability, scalability, security, resource availability, manageability and other aspects that matter a lot. Drupal Taxonomy System. The CMS has powerful taxonomy that helps organizing and tagging the content. The system makes it simpler to target the required keywords as it is mostly designed for community-based projects. Plugins and Designs. You can choose between built-in and integrable Drupal plugins and designs, depending upon your website specialization and business objectives. Cost: Drupal is a free open-source platform. Downloading and installing the system is altogether free for everyone. The rest of the expenditures will mainly depend upon the functionality scale and objective you set. If you wish your project to be full-featured, you may additionally integrate extra plugins, templates, widgets, add-ons and other extensions. There are many of them available on the web and they are available both for free and for extra cost. Additionally, you should take care of hosting which is not provided in the system by default. One of the most suitable and reasonable solutions for Drupal is SiteGround. This is an independent hosting company that has its servers worldwide. The system is characterized by flexibility, good uptime aspect, reach feature set, extended 24/7 customer support etc. The most cost-effective Startup Plan costs $3.95/mo, while the most expensive GoGeek solution costs $11.95/mo. WordPress has always been and remains one of the best CMS, which makes it possible to create quality websites with superior functionality. However, there are users who are not completely satisfied with the range of services provided by the CMS. The system may seem too complicated for newbies because of the necessity to master lots of features at a time. However, they allow creating different types of projects based on users’ special needs. 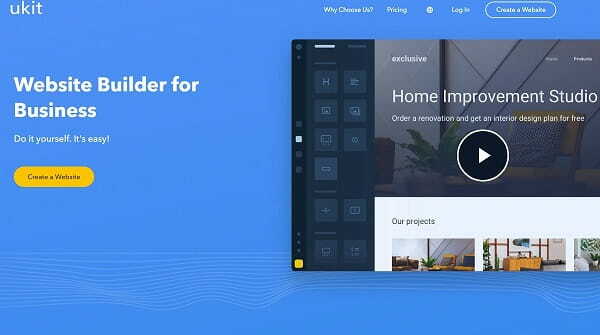 Wix is the all-in-one website builder, which is the most popular alternative to WordPress due to its amazing feature set, extensive web design options, customizability, simplicity and affordability. The system helps complete diverse web design tasks with almost no hassle and waste of time at all. Shopify is the world’s largest and most powerful eCommerce software that allows building small-to-large online stores and offers a broad range of features needed to cover these tasks. 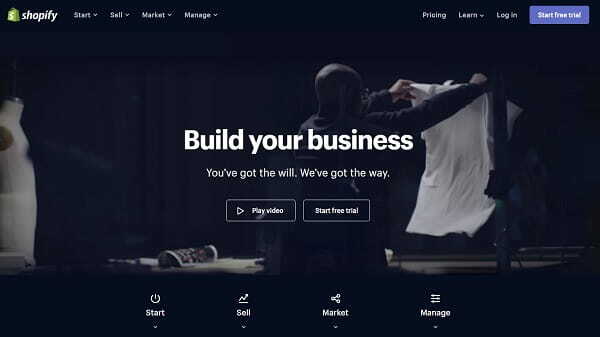 The website builder works great for responsible entrepreneurs, who are customer-oriented and have an intention to develop their eCommerce startups with maximum efficacy. uKit is the easiest website builder focused on the eCommerce niche. Its feature set, design customization tools, SEO and marketing options and other elements are geared towards the development of small and medium businesses. The website builder impresses everyone by its advanced pricing policy, which is more than affordable for contemporary business owners. 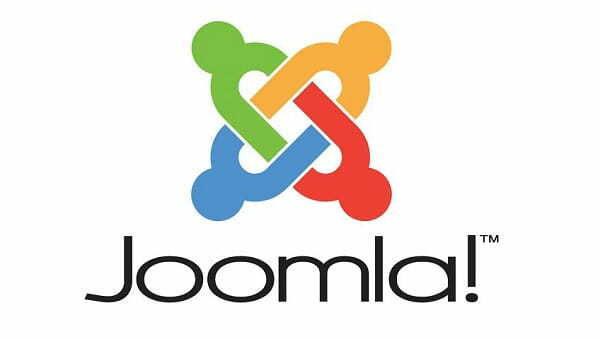 Joomla is a renowned CMS, which ranks second after WordPress in terms of popularity range of services covered, design characteristics, feature set and integration options. The system is one of the oldest Content Management Systems, which works great for the development of full-featured projects, even though it is more complicated to master it as compared to WordPress. Drupal is the eCommerce CMS, the popularity rate is somewhat smaller as compared to WordPress and even Joomla. The service is quite difficult to master, especially for first-time users. It requires integration of external plugins and themes needed to launch and manage small-to-large online stores. WordPress is a full-fledged open-source CMS, which enjoys worldwide popularity and is widely recognizable in the contemporary web design niche. 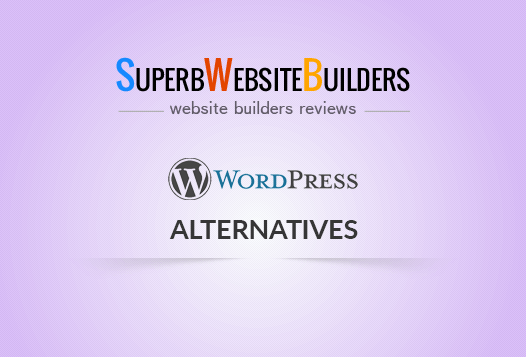 If you have got used to working with the software and face the necessity to look for a better alternative to it, this may take some time and effort to find the best alternative to WordPress. If you currently have such problem, take your time to explore and test the website builders and CMS reviewed in the post. These systems are specially created with the needs and skills of different user categories in mind and you will certainly find the best WordPress substitute among them. Just give it a try!